Yesterday morning I read my blog post about what I have done so far this week, and instantly felt fatigued. This meant that I had to have a relaxing day, and luckily there was the perfect accompaniment for a nice sit down and a cup of tea: a royal wedding. 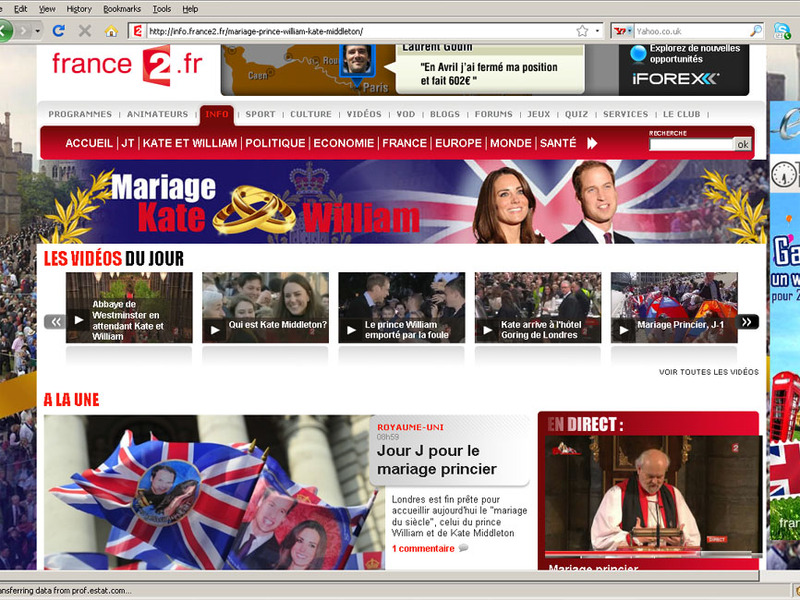 In the interest of being more French, I watched it on France2. They were giving it the full works - 5 hours of uninterrupted coverage, a huge team of reporters and translators, and specialists in all matters of Royal protocol. We were told all about the various regiments of the British Army, the carriages, and every difference (and similarity) between "la forme Anglican" and Roman Catholic worship were pointed out. Everyone was most impressed and excited by the horses and gushing about the spectacle of it all. Part of the Royal Wedding team. At times like this who would believe that the French are republicans? After the tiling the office floor episode, I have now grouted it, and it looks great. All except for the tile that broke whilst I was applying the grout. This annoyed me no end (cue plumbing language and throwing gloves downstairs). One day we may have to lift that tile, replace it, and do the job properly, but until then there is always rugs. Once the tiles were laid it brought home how much of a mess the first floor landing was. 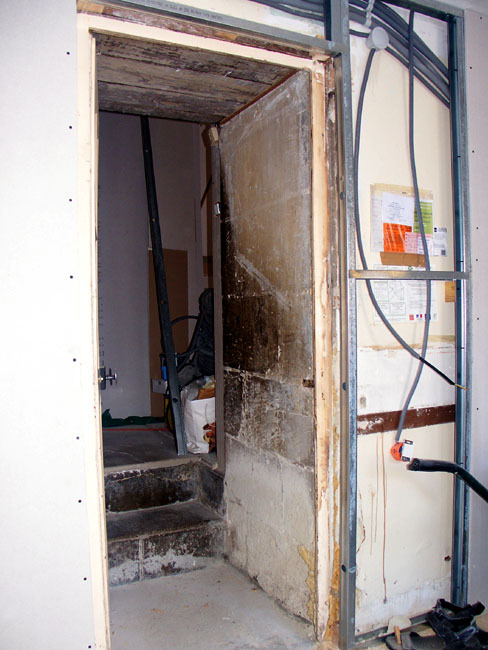 This was no surprise to us, but the new improved tile floor highlighted the state it was in. 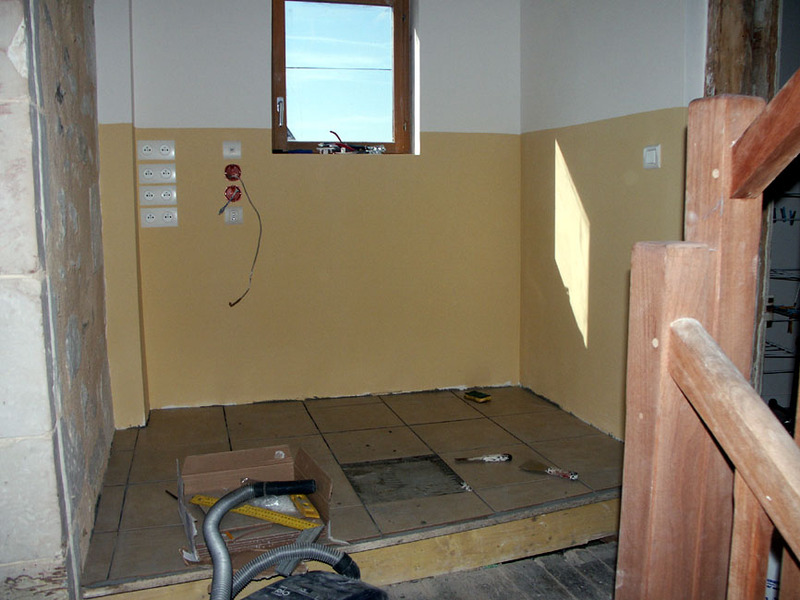 One day on my knees (and massive amounts of dust) and the situation is now more balanced. 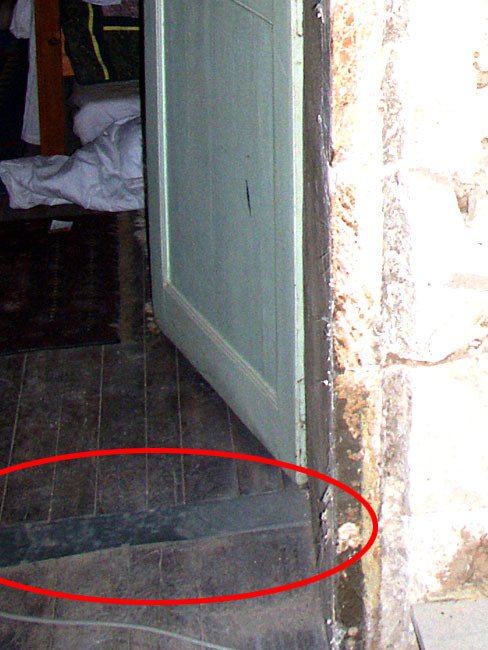 All this activity on the landing has solved one mystery: We have often wondered about the width of the zinc strips nailed to the floor in the doorways. 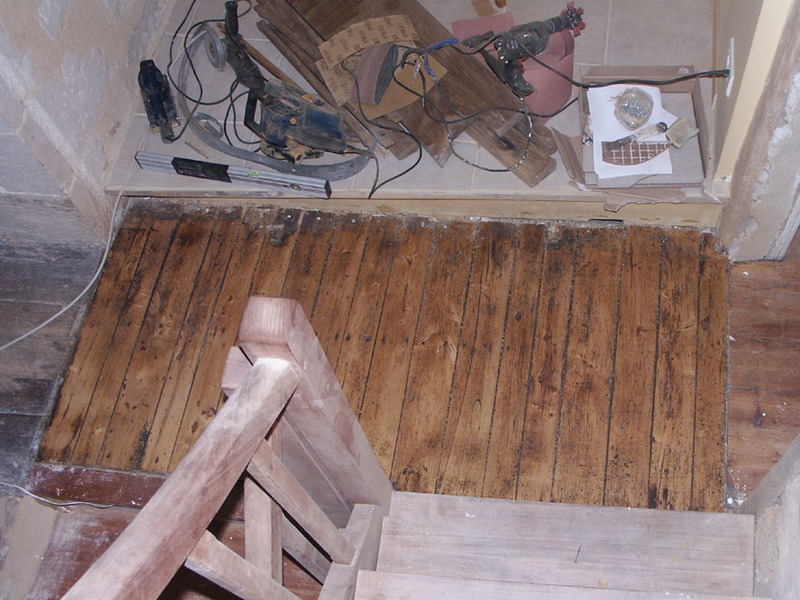 We knew that it was because it was hiding the joint where floorboards laid in different directions met, what we didnt realise is that the floorboards in the doorways have no joists. They simply rest on the stones at the bottom of the door, and the zinc strips hold them up to the level of the floor where there are floorboards on joists. 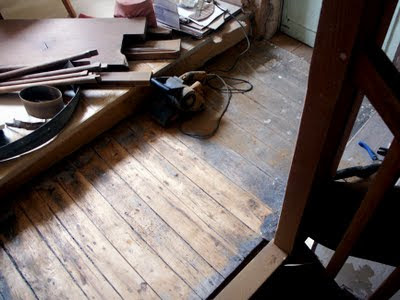 I have removed the zinc and skew nailed the floorboards together, but will have to buy something to hide the 1cm gap between the two rooms. I have also found another banister to complete the hand rail. The new banister was one from the stairs themselves (rather than the horizontal rail) so it needed some adapting, but that is now done. 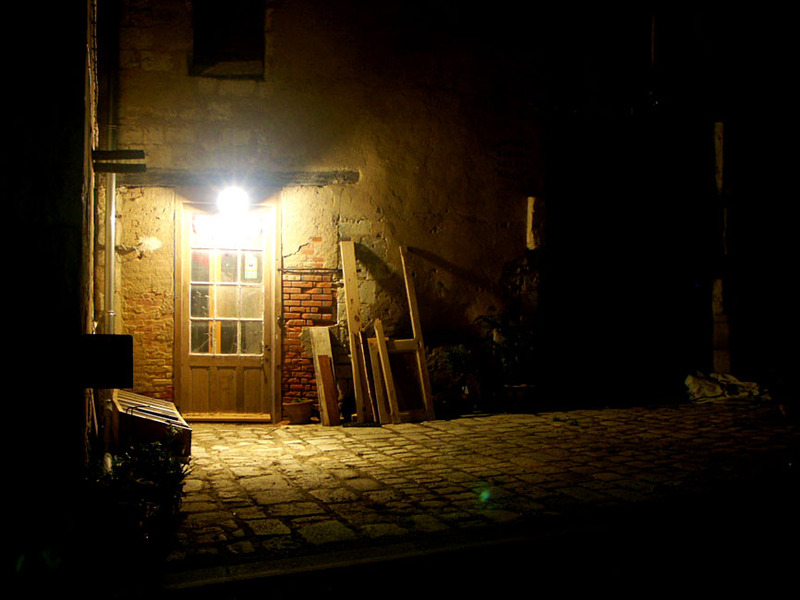 In between times, we took the opportunity to put up the light over our front door. The wiring has been in place for about 9 months but there was always something else more pressing to do. Needless to say, when we got around to it this was a more complicated proceedure than anticipated because the door frame was in a bit of a state: what started off as "just screw the lamp to the wall" became "first find some wood to replace part of the doorframe, then work out how to fix it, before screwing the lamp to the wall". Still - the job's a good 'un. 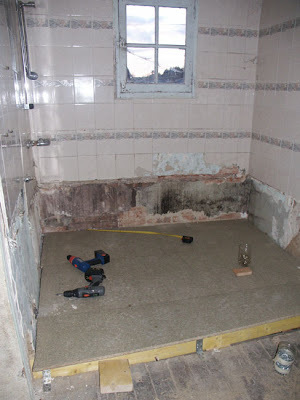 Next step, cleaning the new bathroom floor so tiles can be laid, and getting the plasterer in to do the joints for the kitchen walls and ceiling. One fine evening in mid-May last year we went for a walk around one of our favourite Preuilly circuits. When we got to the base of the town water storage unit we made a little detour because we knew there should be orchids at the end of it. The detour involves climbing up some steep earth and log steps, then hauling yourself up by a chain on to the top of the mound covering the water tank. Several species of orchids grow on this spot, unseen by passersby. 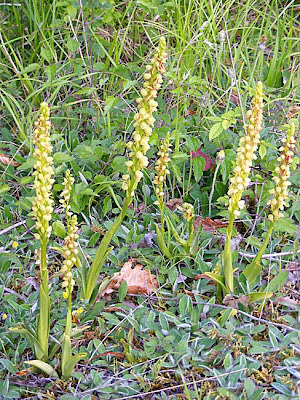 On the day we visited the Man Orchids Orchis anthropophora (Orchis homme-pendu in French) were out in profusion. There were Monkey Orchids Orchis simia (Orchis singe) too, but they had been frosted a few days before and were brown around the edges. Man Orchids are presumably hardier and appeared completely undamaged by the frost. They are quite yellowy on this site, rather than green, and I wonder if this is because of the extremely poor soil they are growing in. 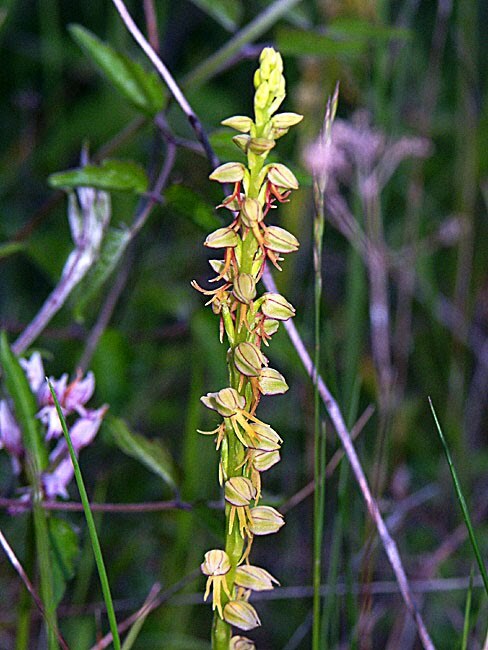 Man Orchids grow on calcareous grassland in full sun and flower from the beginning of May to the beginning of June. They are protected in Centre. The flowers are unusual in that they don't have an eperon (the spur at the back of the flower which holds nectar) but in fact the species is closely related to Lady Orchids Orchis purpurea (Orchis pourpre), Monkey Orchids and Military Orchids Orchis militaris (Orchis militaire) and hybridises with them regularly. 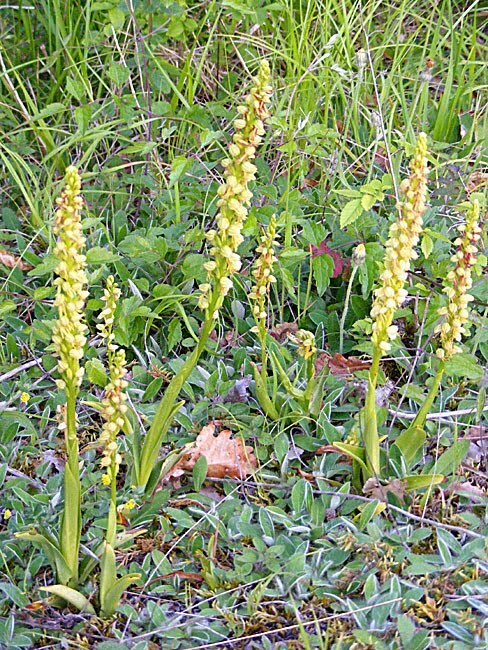 In the Touraine, Man Orchids are found almost exclusively only south of a line between Loches and Richelieu, but they are quite common in the Claise river catchment. On Tuesday I had to go up to Bertu's to pay our latest plumbing bill, so I opted to walk via the routes rurales and check on the orchids growing on the town water reservoir tank. Plenty of both Man and Monkey Orchids, even in the severe dry on top of the tank. The water tank is situated behind the chateau on the highest spot in town. 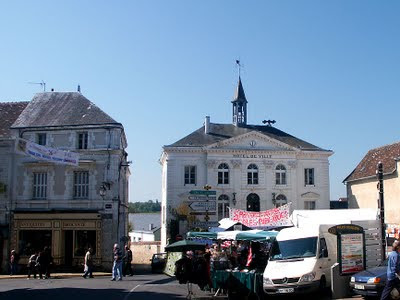 The commune of Preuilly manages its own water supply rather than contract it out to a big specialist company. This is one of the reasons our rates are so low. When I went to the mairie to pick up my garbage bag issue about a month ago I was given a sheet outlining the results of various quality tests that had been conducted on Preuilly's water supply. I was proudly informed that Preuilly's water is extremely high quality. The tests show no bacteria, no nitrates, some naturally occurring calcium, iron and fluoride (but not enough to affect health) and no detectable pesticides. The water comes from two bores in middle of town, harvesting water 80 - 90 m underground. 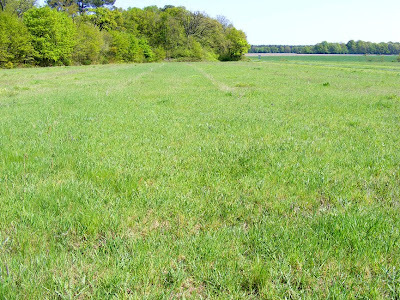 My walk took me along the old defensive embankment behind the chateau, then through the fields - fallow, wheat, oats and canola. The route hadn't been mowed and was full of wild flowers and insects, including my first dragonfly for the season, a clubtail. The Glanville Fritillaries butterflies were flitting hither and thither, along with the occasional Queen of Spain Fritillary and quite a few Short-tailed Blues. 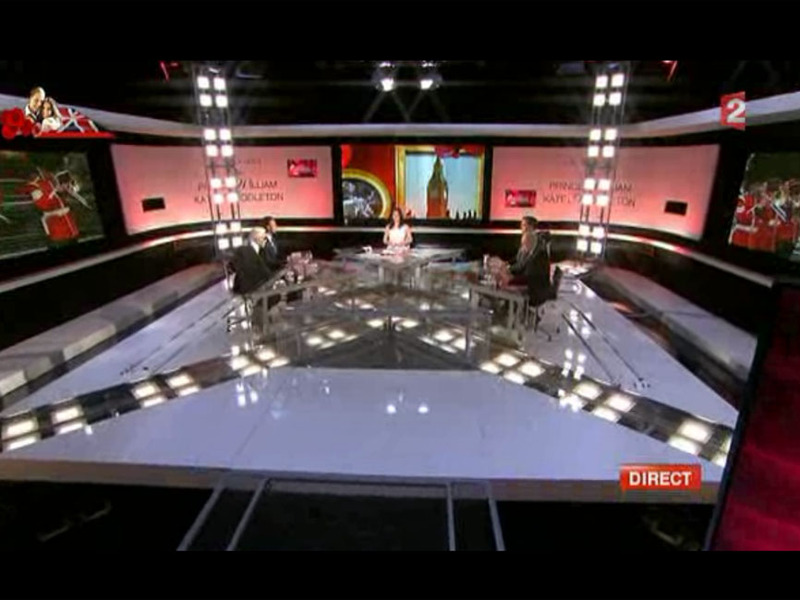 The other day I went over to visit Sylvie Navarro at La Chauvelière. 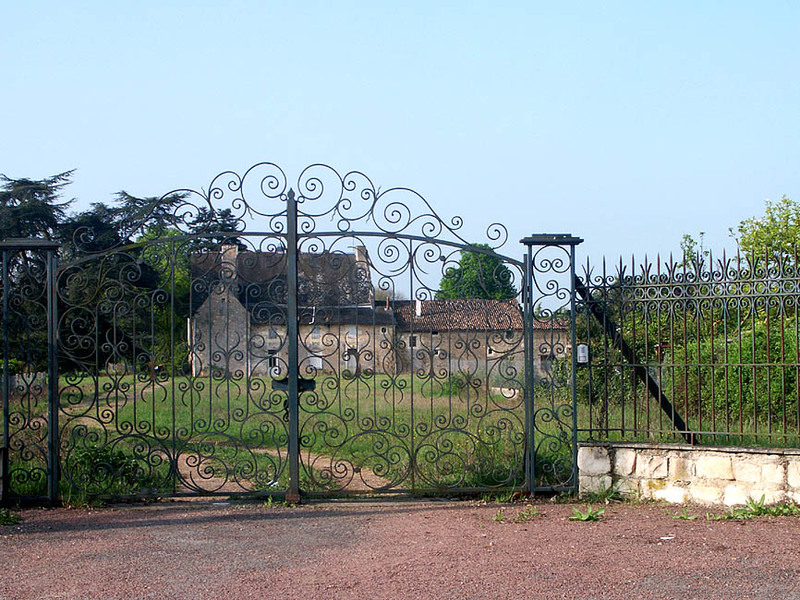 She runs a livery stable near Paulmy, as well as having a gîte and managing a gîte on behalf of the Château de Châtelier. When I arrived she was busy worming some horses and her small daughter came running to greet me. Sylvie's Selle Français (French Saddle Horse) is the bay. Had I driven all the way from Australia and had I seen an ornythorinque? No, there was too much ocean in between France and Australia, and only in a zoo. Ornythorinques are mignon, apparently. Fortunately I was able to retain some cred by telling her that I had seen in the wild all the other animals and birds in the picture book she showed me when we stopped for a cold drink, and indeed, had sometimes had koalas in the garden. The gîte at La Chauvelière. The Navarros live in a really magical place, hidden away in the woods. Sylvie is from Lille, but she clearly loves being able to ride through the countryside here and be close to nature. The farm buildings are laid out in three long ranges. The family live in the far end of the righthand range, and the stable is at the other end. 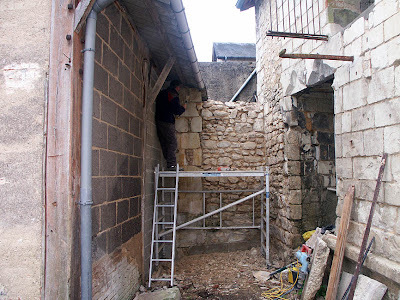 The gîte is in the middle, with a cart shed at one end, and the third range is a modern corrugated iron hangar for machinery, car parking and shelter for the horses. 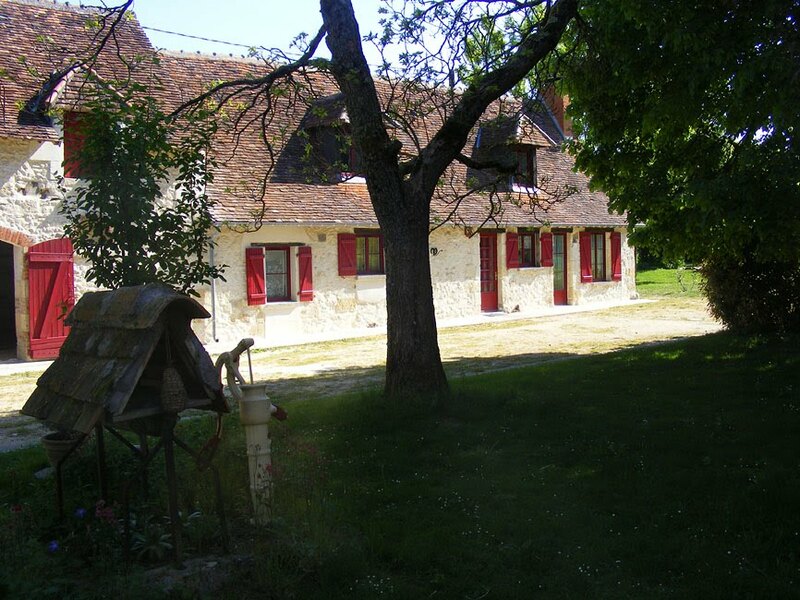 The gîte sleeps up to 10 and would be ideal for extended family groups, especially if they liked cycling or walking. Sylvie even offers guests the opportunity to holiday with their horses, although she admits she rarely gets visitors who arrive on horseback. A troglodyte dining area in the gîte at Châtelier. When we went over to see the horses, Sylvie's pregnant Selle Français mare, an Appaloosa, a Shetland pony, a donkey and a couple of colts were hanging about in the shade. Only a chestnut colt came over for a scratch, and the donkey remained resolutely asleep. 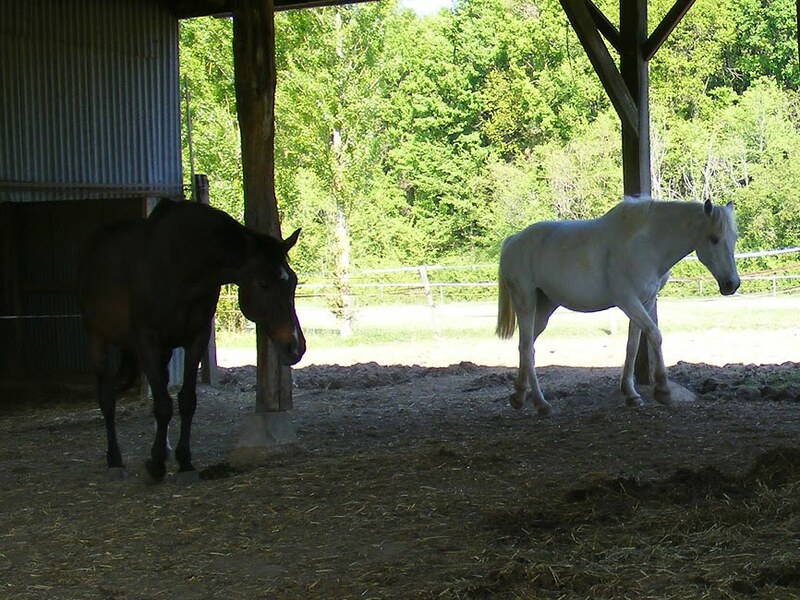 The horses stay outside all year, only coming in to the stable if they are sick. I commented on how surprised I had been that horses in the UK spent so much time in stables. Sylvie agreed with me and said that she had noticed that English horse owners in the district seemed to keep their horses stabled or worse - rugged - even when the weather was warm, which we both felt was not good for the horses. Then, after hurriedly dissuading Sylvie from finding me a retired Percheron for the orchard, we went off to look at the other gîte. 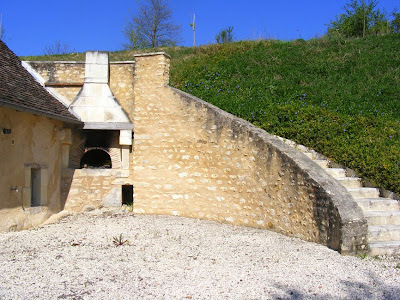 The troglo gîte has a bread oven - great for making pizzas. 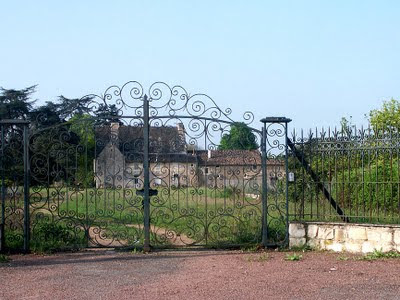 This one is next door to the marvellous Château de Châtelier, and is semi-troglo. 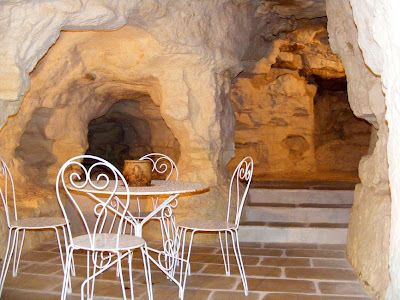 It looks like a normal little house from the front, but once you get inside you realise it is a warren of caves carved into the rock. Amazingly, it also sleeps up to 10 (although I suspect is more comfortable for a maximum of 6) and has a wonderful roof terrace which looks out to the château and over the field where they currently pasture a quartet of young colts (the château farm is an anglo-arabian horse stud). Guests also get the use of the château swimming pool and can use the barque on the étang to go fishing. The view is current marred by some power lines - but not for long. They are scheduled to go underground in the autumn. Both gîtes are in stunning locations and more peaceful and relaxing places would be hard to imagine. 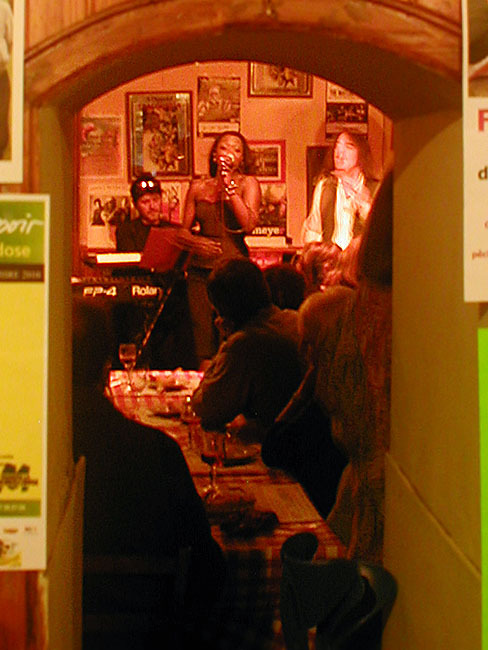 Nearby Paulmy is small, but home to the Bar de l'Union, which has regular live music. 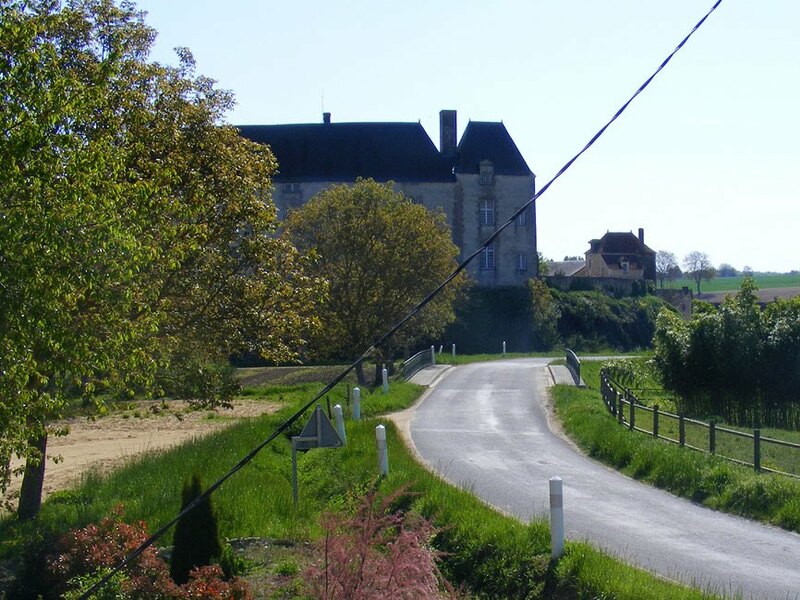 Les Amis du Châtelier also host concerts in a magnificent barn in the grounds of the château, and the part of the château complex can be booked for private functions. It hasn't rained much the last six weeks, but on Saturday morning the forecast for the afternoon and evening changed from sunny to storms, with a weather warning. I decided to experiment with timelapse film making, so set up the camera pointing the way the weather comes from and expected to get huge banks of clouds rolling in complete with lightning and torrential hail (we usually get hail at least once at this time of the year). Nothing. Not a drop. We didn't even hear a rumble of thunder. We did get a very light sprinkle of drizzle at 10.00 Sunday morning, and yesterday we had 3 hours of thunder and enough rain to wash the dust off the roof, but that's it. I guess it's back to watering the potager by hand - again. And the Band Played Waltzing Matilda is the name of a song, written by the Scots born singer songwriter Eric Bogle, who has lived in Australia since 1969 (and is, in fact, a distant relative by marriage of mine). The song very quickly gained worldwide popularity and has been recorded by about 100 different artists. In Australia, its initial reception was considerably more mixed, with many people feeling it was an attack on the returned soldiers themselves rather than war in general. I was 11 when it was written and for most of my childhood, the television news backdrop was the Vietnam war. By 1971 the surviving WWI veterans were starting to getting thin on the ground, and people on all sides of the political spectrum were deeply unhappy about the creation of a brand new crop of veterans, particularly as they were conscripts. Feelings were running high, no matter whether you wanted to support the veterans or the peace movement (or both, as many ordinary people did). This song touched raw nerves and took a while to settle in on its home territory. For some people this is the greatest anti-war song ever, for others, including the songwriter himself, it remains problematic on, shall we say, artistic grounds and it's just not angry enough, with its relentless tugging of the heartstrings. We've chosen to present the June Tabor version here because like many songwriters, Eric is often not the best interpreter of his own material, and this is apparently his favourite version. Although the Pogues did the most famous version, June's crystal clear voice allows the listener to take in the self-explanatory lyrics better. The only clarification that may be required is of the phrase 'Waltzing Matilda' itself. The expression 'waltzing Matilda' is the dry Australian slang for trudging from town to town, itinerant job to job, carrying all your possessions in a blanket roll, usually called a swag in Australia, but often given a personal female name by individuals. If you are interested in the history of Australian soldiers on French soil, check out the Facebook page of the Lost Diggers. There you can see a remarkable collection of images taken by Antoinette and Louis Thuillier on their farm at Vignacourt, of soldiers during their brief times of respite from the front line in 1916. The more than 3000 photos, discovered in the attic of one of the barns on the farm, also includes pictures of Americans, Canadians, Indians, Chinese, French, New Zealanders, British and Germans, as well as some images of closer to the action. Our friend Dave is currently in the Somme, once again taking photos for TWGPP (the War Graves Photographic Project). The aim of the project is to make a photographic record of all the Commonwealth War Graves, and Dave is helping at the rate of 1000 photos a day. He was our guest blogger two years ago. Today is also Souvenir des Déportés in France, which remembers the French men and women who were deported as forced labour, interned or sent to concentration camps during the Second World War. 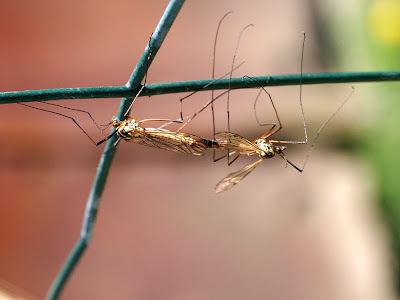 This pair of Spotted Craneflies Nephrotoma appendiculata was snapped by Simon as they mated on our back fence. The larvae resulting from such a union live in the soil and can be a garden pest, especially in areas of cultivation. However, these 'leatherjackets', as the larvae are known, dessicate very easily, and are likely to do poorly this year, since it is so dry (at least, so far). The newspaper headline the other day translated as 'Touraine fears a record drought already', because we had less than a quarter of our average rainfall in March and no rain at all so far in April. Since these should both be quite wet months, gardeners, farmers and wild fauna and flora could be in for a very difficult time of it. 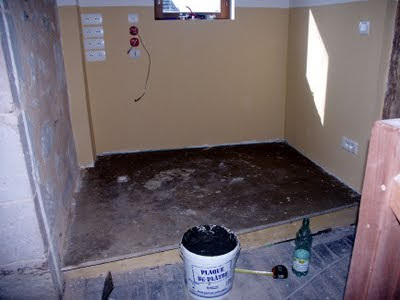 Ever since I remade the bathroom (but now the office) floor, there has been a six inch step up into the room. In order that people don't slip off the upper floor level it has been our intention to use some of the pieces of the old staircase we saved when the new staircase was installed and put up a rail. 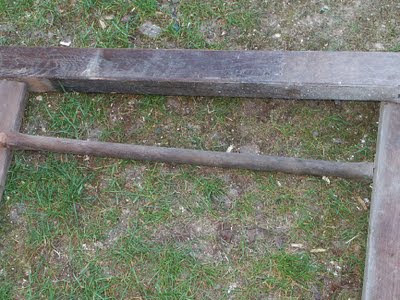 Yesterday I collected up some of the pieces, and in a right sorry state they were, too. I am not sure how old they are, probably C19th, but for a long time they have been unloved. A couple of hours with sandpaper and things were looking considerably brighter. One to go. No prizes for guessing which one! 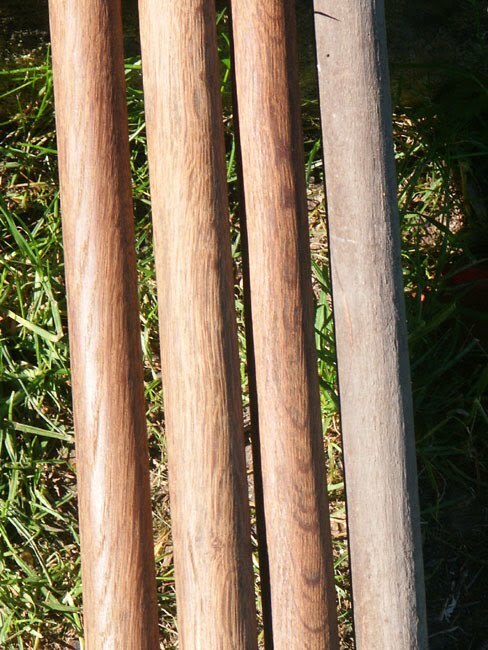 Today I will slip over to Bricomarché in the hope they have some bits of oak, as I need to suppliment what we have - I am not sure why, but we have saved more balistrades than banisters (maybe because they are interestingly bent, and banisters are just sticks*) . 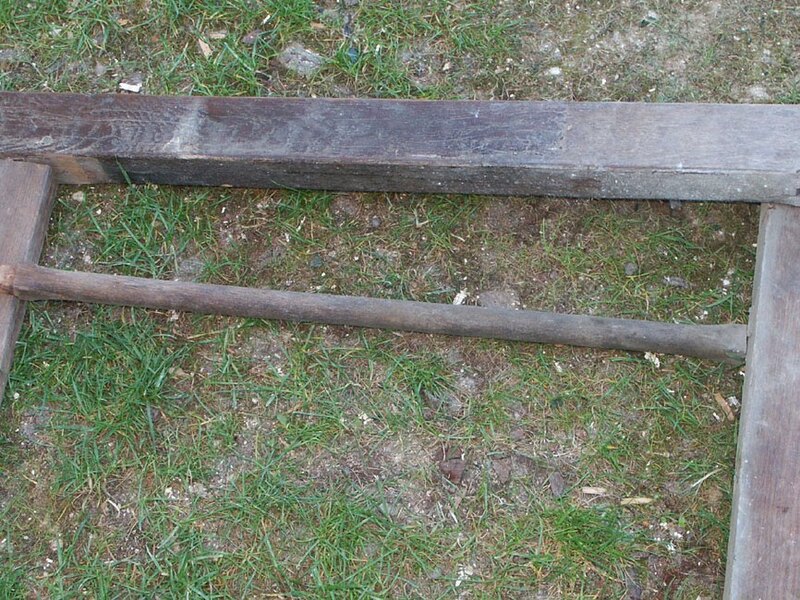 I could go to the sawmill, but I only need two little pieces of oak, and the sawmill would be a long way to go for just that. * that's right - you have never slid down a banister. You may, however, have slid down a balistrade. Yesterday our new range hood was delivered by Angela and Dennis, who bought it over from England. In return, I cooked lunch: smoked chicken, done on the Webber. It was amazingly simple. Defrost a chicken overnight, and next morning make a marinade with soy sauce, oil, juice of half a lemon, dried parprika, garlic and a splash of vinegar. Stick the squeezed half lemon in the cavity, pour the marinade over and leave for a couple of hours. Two hours before lunch light the bbq with at least twice as much charcoal as you think it will take and leave for 30 minutes. Rake all the coals to one side and put a drip tray in the space made, place the chicken over the tray, add oak chips to the coals and put the lid on. 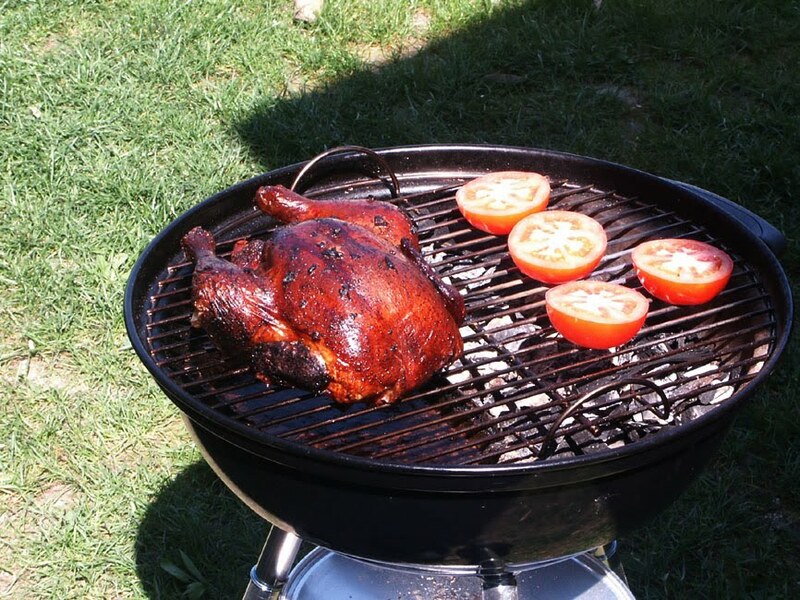 I am not sure if checking every 5 minutes is compulsory, but the bird turned out perfect. That's what yesterday was all about. I had high hope of getting a lot done, but instead I did lots of little things towards being able to finish stuff today (or tomorrow). The first job, and one I have been doing for a couple of days, is painting the kitchen door. Last weekend I worked on the doorframe, cutting out pieces that had split and replacing them. 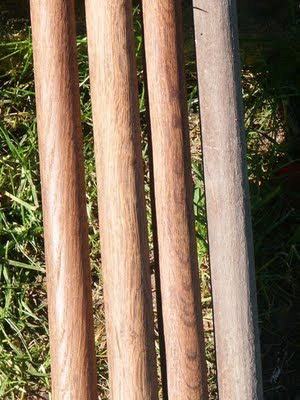 This means that the door should shut flat and we will be able to put draft excluder on all of the frame. 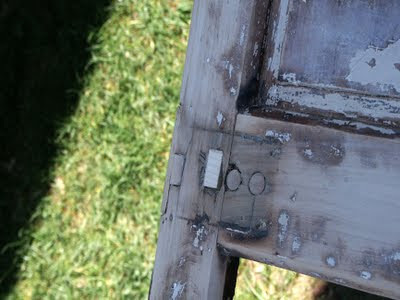 During the past couple of days I removed the glazing and sanded the door itself, and started rebuilding little bits where the previous fittings were. Now they are sanded back level with the rest of the door, I have started the painting process. but when I do things they stay done. Disaster (or at least, narrowly averted disaster) on the tiling front though: I was just about to start grouting the tiles when I realised that one corner of one tile was moving up and down when I rested my elbow on it. This meant removing the tile, chipping back the glue, and putting a new tile in. I think my issues on Tuesday were because I hadn't made the glue runny enough, because yesterday's glue was made runnier, and the tile set a lot easier. Also an almost disaster on the painting front. We are painting the bathroom walls two colours, and as I removed the masking tape I removed a large(ish) lump of paint. I don't know why the paint hadn't attached to the undercoat properly, but it means I will have to do some touching up. Added to that, we are deep in drought (spring isn't even a month old and already the locals are in doom and gloom mode) and I bought the wrong stuff at BricoDepot the other day. 80kg of the wrong stuff. Still: it could be worse, I could have a sore neck and back. Me? I'm a solid little lump of happiness! The room which was to have been our second bathroom is now destined to be a micro-office. 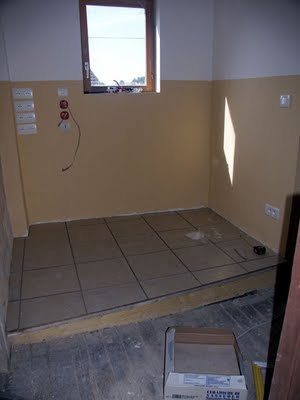 We have replaced the window, insulated, plasterboarded and painted, and yesterday I started tiling the floor. It isn't a big job, but I think I am fundamentally unsuited to tiling. It's all so permanent, and you have to get it right. I am pleased with my tile cutting: I only wasted 1 tile (I had allowed almost twice as many tiles as I needed, so I have tiles to spare) but gluing them down was fraught. It was a really hot day, I kept perspiring over my glasses and into the glue, and I was totally unsure of myself. The new office, floor primed and ready to go. Anyway - the tiles are now glued (with an amazing amount of glue, I hope not too much) and this afternoon I will know if the glue is holding. I am hoping that any irregularities will almost disappear once I have grouted, and even if they haven't, a rug should solve most issues. It has, however, sorted one issue in my mind - I will not be laying the 13 metres of tiles we have to put into the new second bathroom in the attic. For that, I will GTMI. Recently English friends of ours who have a house in Preuilly acquired an old brass fireman's helmet. It was purchased at auction in a small town in southern England, but the helmet originally came from Preuilly-sur-Claise. 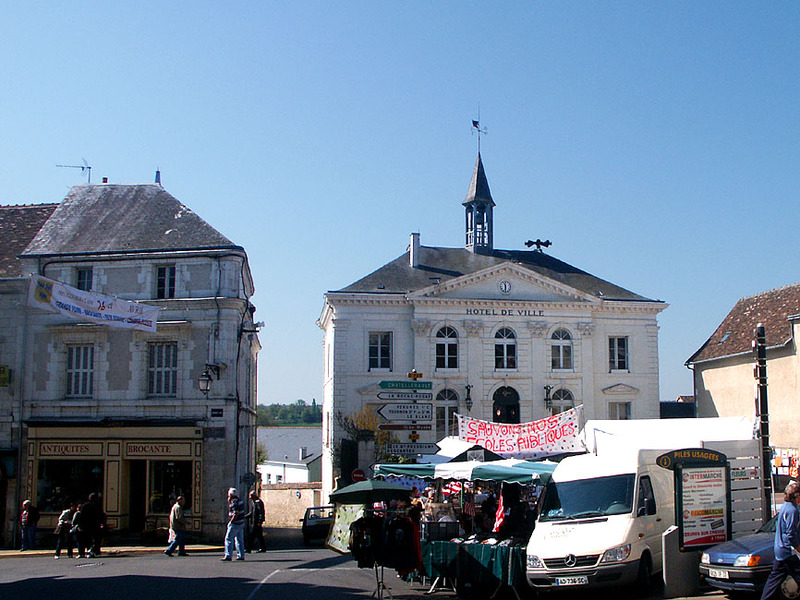 This isn't the first instance of English friends of Preuilly returning the town's heritage. A couple of years ago, two watercolours of churches in town arrived back via an art dealer in the south of England and the kindness of the English couple who bought the portfolio of paintings. 19th century fireman's helmet from Preuilly-sur-Claise. 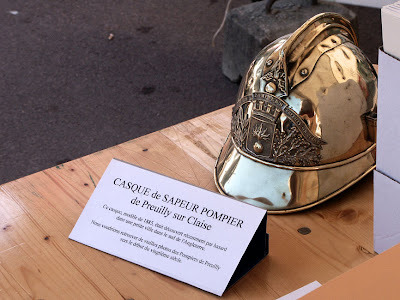 Casque de Sapeur Pompier de Preuilly sur Claise. Ce casque, modèle de 1885, était découvert récemment par hasard dans une petite ville dans le sud de l'Angleterre. Nous voudrions retrouver de vieilles photos de Pompiers de Preuilly vers le début du vingtième siècle. Fireman's Helmet from Preuilly sur Claise. This helmet, the 1885 model, was discovered recently by chance in a small town in the south of England. We would like to find some old photos of Preuilly's firemen from around the turn of the 20th century. Firemen are popular modern day folk heroes in France. You can not only buy the traditional calendar ( if you are lucky, with pictures of naked firemen, but usually just of firemen training in the full protective kit) at the end of the year, with proceeds going to their Christmas party, but you can also buy statuettes and various other collectables sold both commercially as souvenirs or as fundraisers for their activities. Here in Preuilly most of the firemen are volunteers, and like in many small towns, they run a cadet scheme for teenagers, who learn first aid, abseiling, how to drive the fire truck and all sorts of confidence and discipline boosting skills. The first Sunday of the month the town klaxon sounds, and the mayor treats the firemen and women to drinks in the salle de fêtes. It is frequently the pompiers and not the gendarmes who officiate and direct traffic at town events, and they are kept busy with rescue services such as traffic accidents, emergency airlifts to hospital and removing wasp nests from buildings as well as the occasional fire. Now that April has arrived I've gone out into the 2km squares I have been allocated by STERF and chosen my exact transects for surveying. 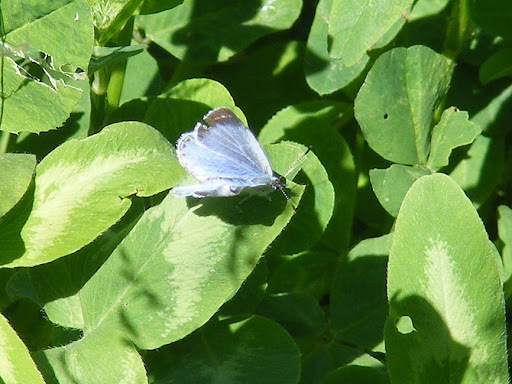 I have tried to get a range of habitats, both good and bad, to provide a true picture of the state of the butterfly population in the Touraine du Sud. wild violet on the edge of the woods. 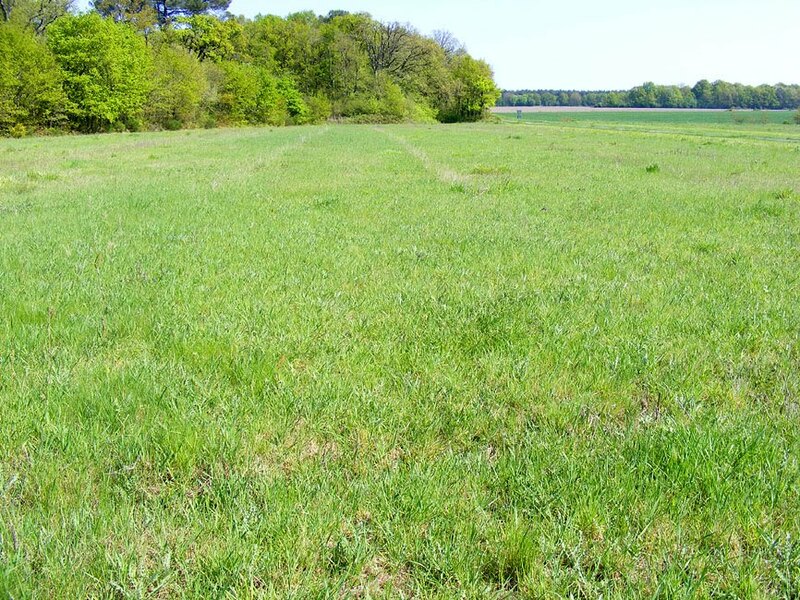 An area of unimproved grassland on the south facing slope of a limestone spur, surrounded by broadleaf woodland, once probably pasture, now mown perhaps once a year. The steep grassy north facing slope of a limestone spur, being overtaken by conifers, junipers and other scrub, surrounded by mixed broadleaf and conifer woodland, once probably sheep pasture and now abandoned. A rural track with improved pasture one side, broadacre crops the other. A rural track through intensive broadacre cultivation. A rural track through semi-improved pasture with a well vegetated ditch along one side. An area of damp natural calcareous grassland, not grazed by domestic stock but may be occasionally mown, and wild boar forage extensively, surrounded by stands of broadleaf woodland, conifers and heath. An area of damp natural calcareous grassland, not grazed by domestic stock, but wild boar forage extensively, surrounded by broadleaf woodland and beginning to revert to woodland. An open ride through tall (2m+) heath scrub. An area of flat open natural herb and flower rich calcareous grassland, mown periodically for hay. A forest track along the edge of broadleaf woodland on one side and semi-improved haymeadow on the other. - she and her habitat (below) are in serious decline. 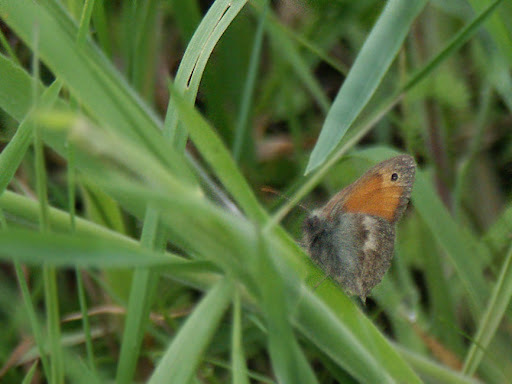 The species seen were (numbers refer to habitat list above): Dingy Skipper (8); Swallowtail (10); Brimstone (1, 5, 6, 7, 8, 9, 10); Small White (1, 2, 3, 5, 7, 8); Orange-tip (1, 2, 5, 7); Wood White (1); Violet Fritillary (1, 2, 5, 8, 10); Short-tailed Blue (9); Holly Blue (2); Small Heath (1, 9); Comma (8); Peacock (3, 5). 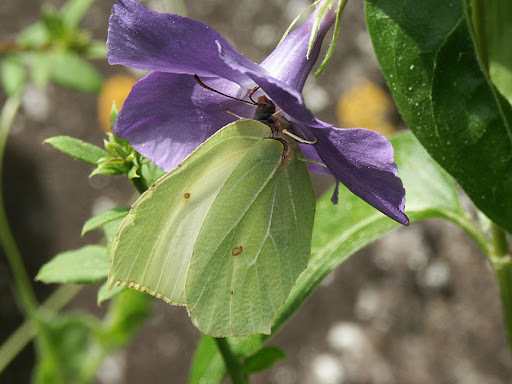 Not only was the Brimstone seen at the most sites (7 out of the 10) it was also far and away the most frequently sighted in terms of individual butterflies, with 53 being recorded. 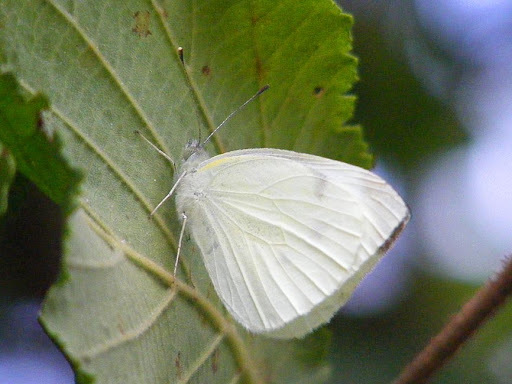 Small Whites were encountered at 6 of the sites, but in fewer numbers than Violet Fritillaries overall (13 Small Whites and 18 Violet Fritillaries). High numbers of Brimstones is to be expected at this time of year, as they overwinter as adults. 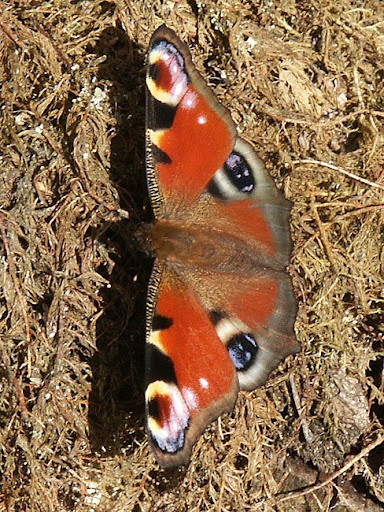 The average number of individual butterflies seen per transect was 10 and the average number of species 3.2. Each transect is 5m wide and as long as it takes to walk in 10 minutes whilst counting butterflies (in practice about 100 - 200m). of a Violet Fritillary Clossiana dia (La Petite Violette). 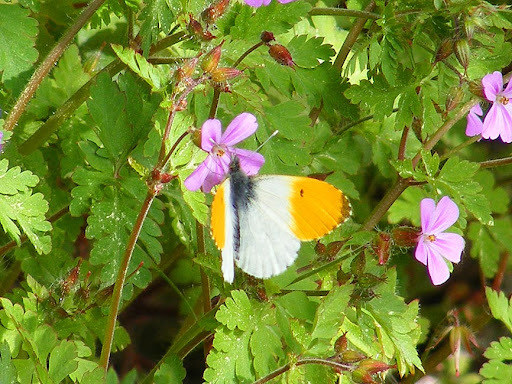 Orange-tips have been recorded in exceptional numbers this year, but by the time I did my survey their numbers were dwindling somewhat (they are an early spring species), and perhaps my choice of habitats did not favour them. You tend to encounter them along ditches and damp patches with plentiful supplies of Cuckoo-pint, the host plant. Preuilly and Yzeures on the D104 may recognise it). The poorest habitat was number 4, a track through broadacre crops (at the moment wheat). This transect produced no butterflies at all. 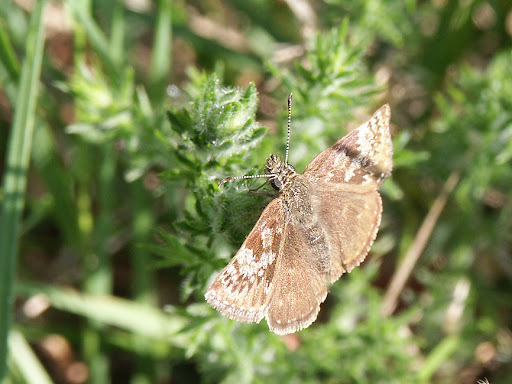 The most productive habitat was number 1, a south facing calcareous grassland slope surrounded by woodland. Neither of these results is unexpected for this time of year. 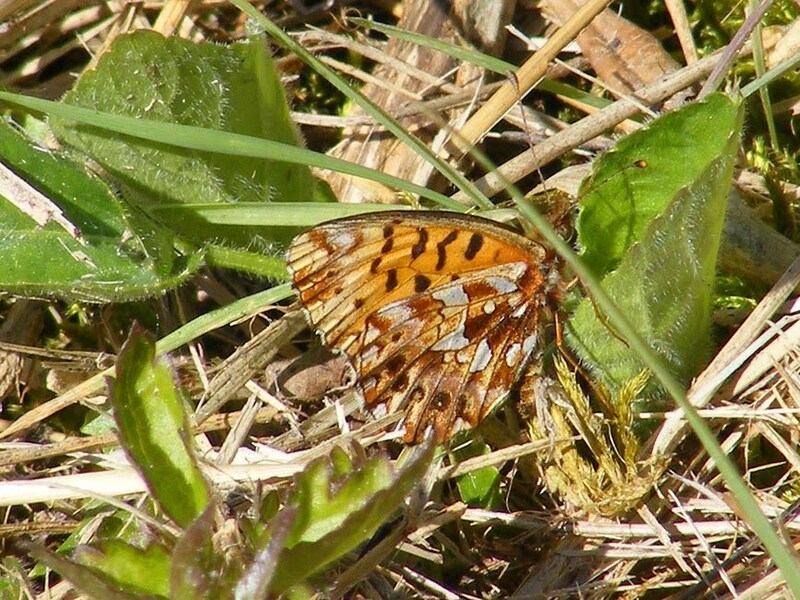 Intensively cultivated broadacre farms are generally poor butterfly habitat, whereas a nice warm south facing slope with some nearby woodland for protection is ideal for early spring. Yesterday was our second Fête de la Saint Georges. Last year we were surprised by how big and bustling it was, this year less so. Because this year St Georges Day (23 April) falls on the Easter weekend, the fete was brought forward. This had the unfortunate consequence of making our special day clash with everyone else's special day, so many of the stallholders had to decide whether to come to us, or the 4 other fetes held in the area yesterday. It was a nice day for a wander. Unfortunately, Preuilly missed out this year. Still - it was nice wandering down the middle of the road and not holding up traffic, and sitting with our friend Louisa having our now traditional sausage and chips lunch, courtesy of the public school association. Last year you couldn't move for stalls and people. The fête is also the traditional time for renewing one's membership of the Archeological Society, which we have done. Hopefully next year, with the fête returned to its proper weekend (the first Saturday after the 23rd April), everything will be big and bustling again. 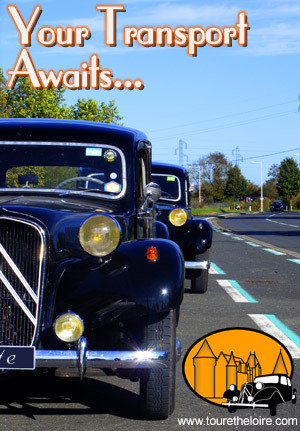 The bike race should also be held on fête day again - this year it will be held on the weekend the fête would normally be: next weekend. This past week we have painted, cleaned, plastered and sanded. Not necessarily in that order, and not necessarily only once (in fact many times... many, many times). We have also almost, but not quite, finished the kitchen walls and wiring: all the wall cladding except one piece is in place, and all the wiring bar one power-point wired. On the old kitchen wall I had stuck various pieces of paper with important information - when the milk lady visits, the opening hours of the dechetterie, my work plan for September 2007, the library opening hours, the frequencies for various English radio stations, and the instructions for the dry rot detectors. I have left these in place behind the new plasterboard wall as a little treat for the next people to work on the house. Pictures of the finished works will follow another day. 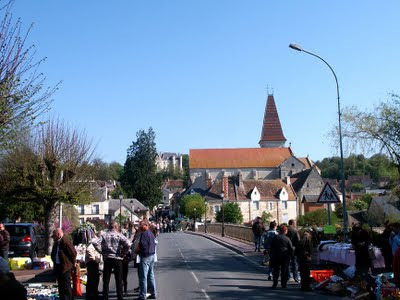 I am having a little lie-in, then inspecting the fete St. George (which is being held a week early this year). calculating how many you need to put out. After an extended and unusually warm spell the weather has been considerably cooler the last few days. Although the days eventually warm up to maybe 18 - 20°C, the nights are getting down to very low digits (1 - 3°C). 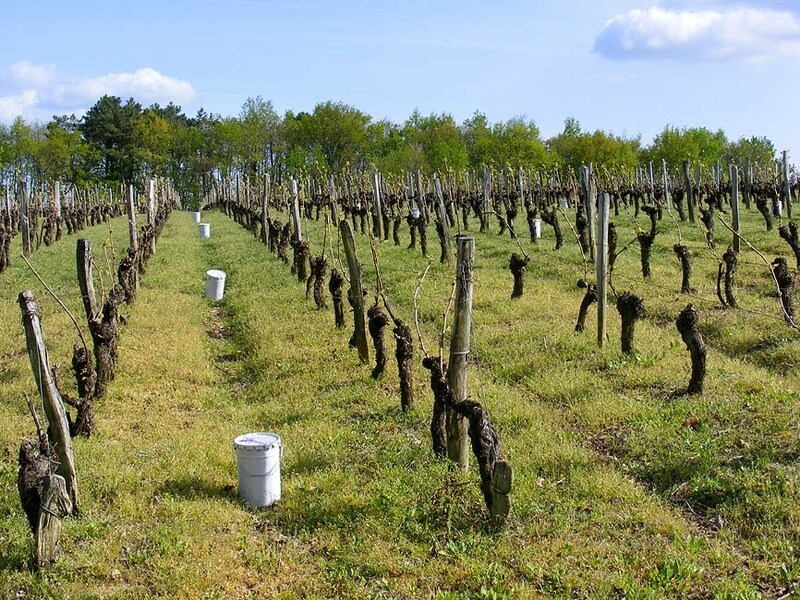 The winegrowers are worried that after an early period of rapid growth in the vines, we may yet have a frost which sets them back disasterously because they already have significant tender new shoots. Frost candles set out in the vineyard. Consequently, the bougies antigel have been deployed in the vineyards near Ken and Walt's, just in case. This is the first time we have seen them, and Ken said he had never seen them before in the years they have lived there. According to the StopGel lid, the candle inside is parafin wax and needs to be placed at different densities in the vineyard, depending on the temperature expected. It seems that the candles work by heating the air just enough to prevent freezing, but they are not suitable to use if there is any breeze, or if the temperature drops below -4 to -6°C (depending on how much moisture there is in the air). In the event, I assume they weren't used, as we haven't had a frost, and the day we saw them there was a stiff cold north-easterly breeze. 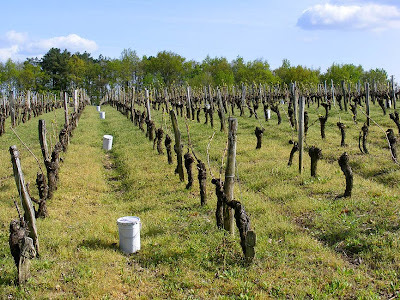 I suppose in the Loire, where frost damage is sporadic and limited, these candles are the only practical and economical solution. 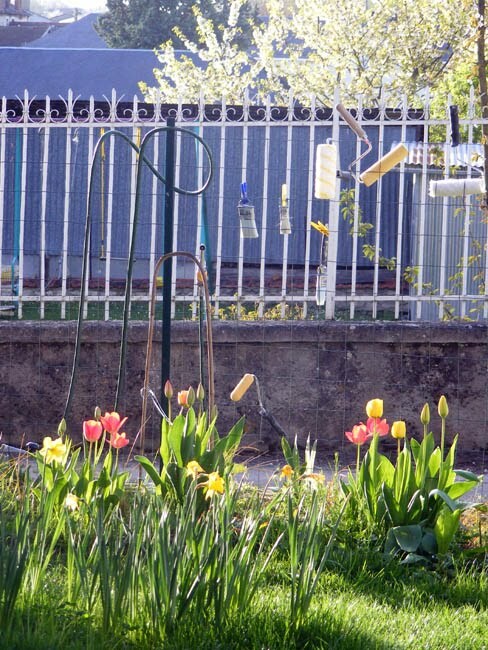 Frost protection is clearly a very technical affair, and the infrastructure is expensive. Other, colder, places in France have traditionally used wood-burning funnel stoves, but I assume the somewhat counter-intuitive modern sprinkler systems for preventing frost damage that I have read about cannot be used in France because it is illegal to irrigate wine grapes here. In early May last year I purchased 10 asparagus crowns from a local grower who comes to Preuilly market in the summer. She only sells asparagus, walnut oil and cherries. Most of her asparagus is the thick white type that the locals prefer, but she also brings some thin green shoots too. When she had crowns for sale (called pattes or griffes in French, meaning limbs or claws) I asked her what type of shoots they would produce, saying that I preferred the thin green ones. She said that's what they would do if I didn't blanch them by piling dirt over them as they grew. 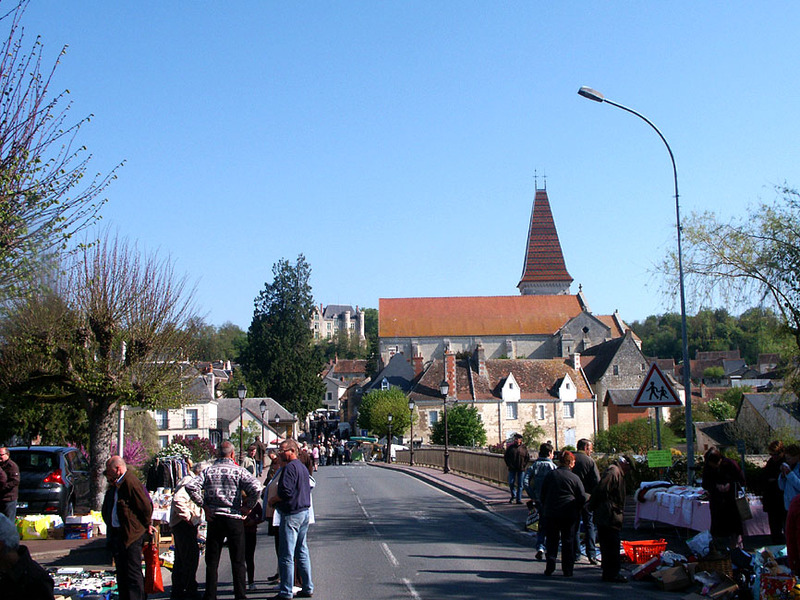 The crowns cost 30c each (a third of the price of crowns at Loches market). At the beginning of the season she was charging a very reasonable 5.50€ / kilo for the spears. the straw mulch last year. Almost immediately after planting most of the crowns had produced a shoot. They all had to be left to produce ferny growth so the plants would establish vigorously. Sadly, I think our lack of water means that asparagus is not going to thrive for me. This year they have produced a couple of weedy shoots each. 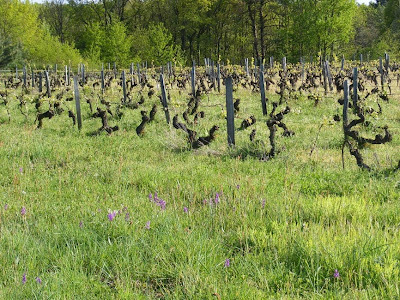 All very unpromising, especially since my visit to Nick Freeman at La Maloterie in the Brenne. 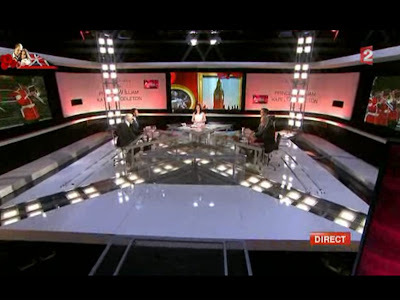 I'd gone over there to discuss developing a nature walk for his farm, which he runs as a chambre d'hôte with his wife. He has so much asparagus he is quite bored with blanching and freezing. The asparagus bed is in quite a damp area, on what was a cowyard. 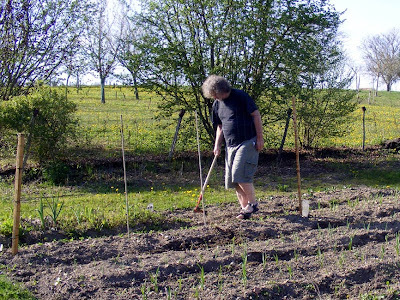 Amazingly, he grew the plants from seed last year, and is already harvesting kilos of spears. He very kindly gave me a fresh bunch and it was the best asparagus I've had for a long time. 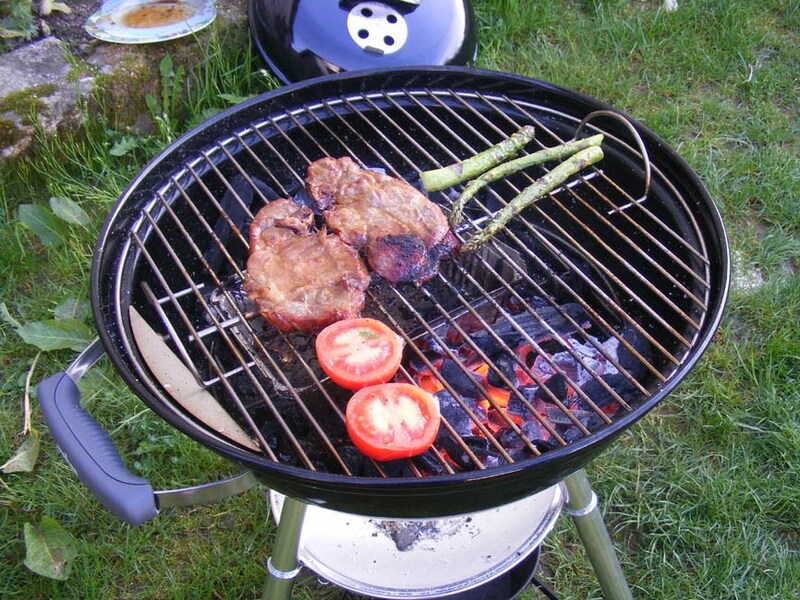 I barbecued a few spears for dinner that night and steamed the rest for lunch the next day. 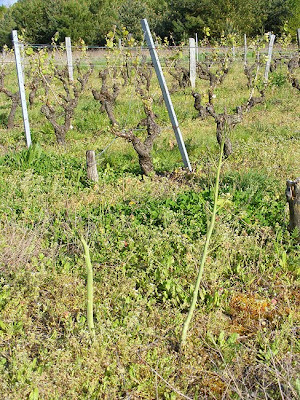 Asparagus that has escaped into the vineyard. A couple of days ago we visited Ken and Walt and I photographed some 'wild' asparagus in the vineyard. This rugged looking stuff, which can be seen at this time of year all over the Touraine on roadsides, ditch banks and fallow land, is not really wild, but the progeny of garden escapees. Genuine wild asparagus is actually a much more prostrate plant, and only found on the north-west coast of France. 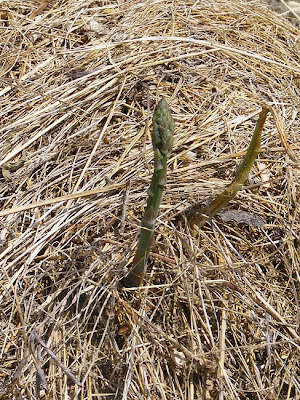 The local roadside asparagus can be harvested and eaten, but it is likely to be stringy and bitter. What Are the Magenta Coloured Orchids? 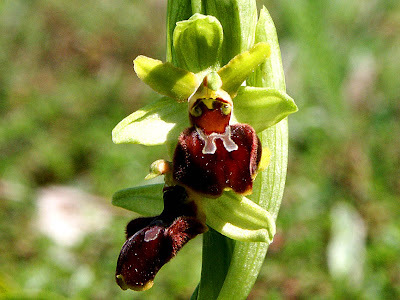 At the moment there are 5 species of orchid that I know for sure are flowering in the Touraine, including the first Early Spider Orchids in our orchard, which came out yesterday. 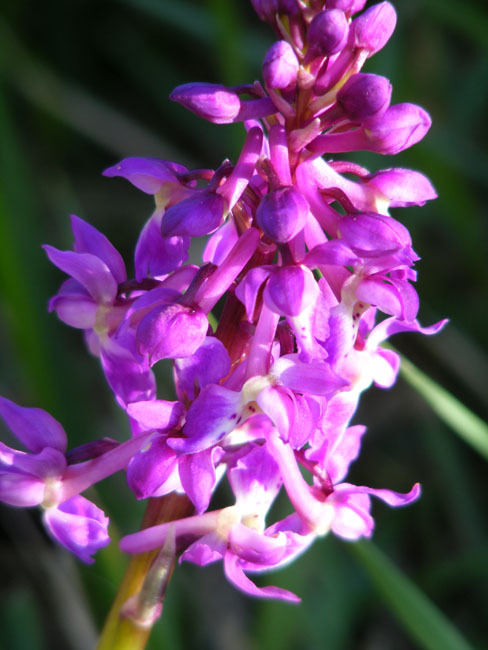 The most common orchid you will see in April is a strong magenta colour, easily spotted on the side of the road as you drive by. 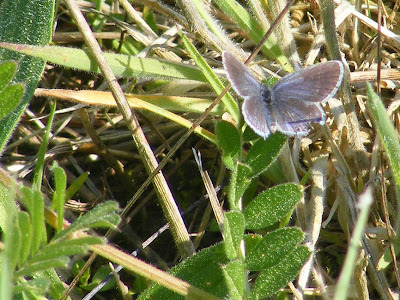 You may also encounter them in damp areas of open grassland. What you and most of the locals don't realise is that there are actually two species of magenta orchid that flower at this time. Unless you look closely you can't tell them apart. 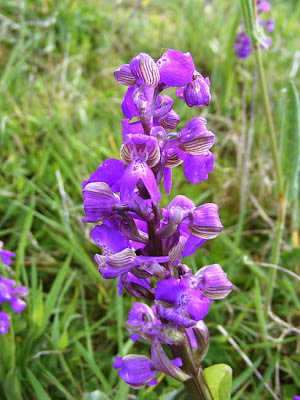 The ones on the roadside are usually Early Purple Orchids Orchis mascula or Orchis mâle in French. 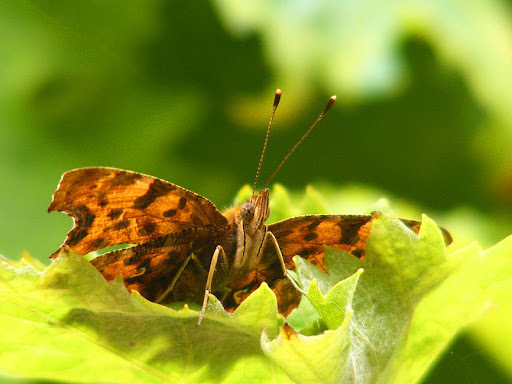 Usually they have leaves with big purply brown spots on them. 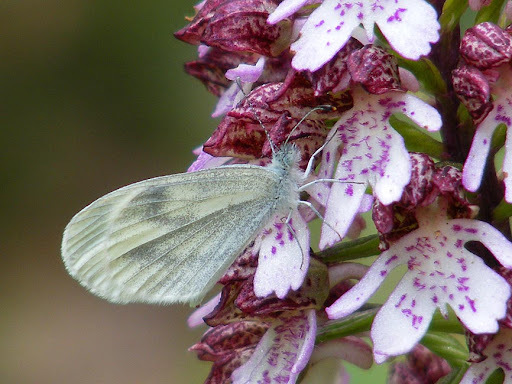 The other species, more likely to be encountered in open grassland that is prone to be a bit wet, is the Green-winged Orchid Anacamptis morio or Orchis bouffon in French. 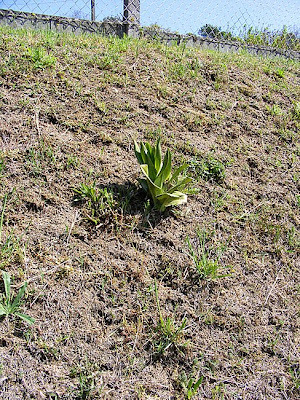 Its leaves are always unspotted and its upper petals always have fine green or dark red veins. 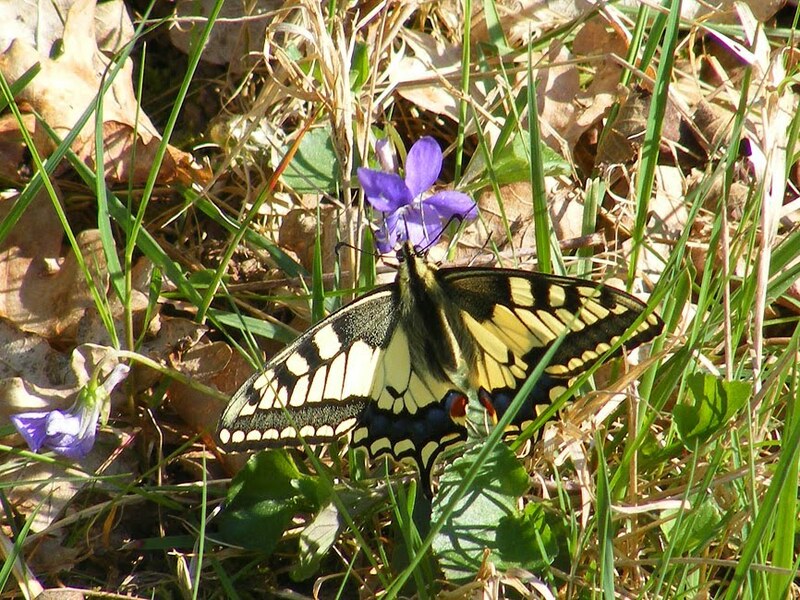 My observation is that Green-wings have more spotted lower petals too. Both can have flowers that vary in colour from white to deep purple red, and the Early Purples sometimes don't have spotted leaves (but they never have the strongly marked veins on the upper petals). like here near Ken and Walt's, where they are abundant. 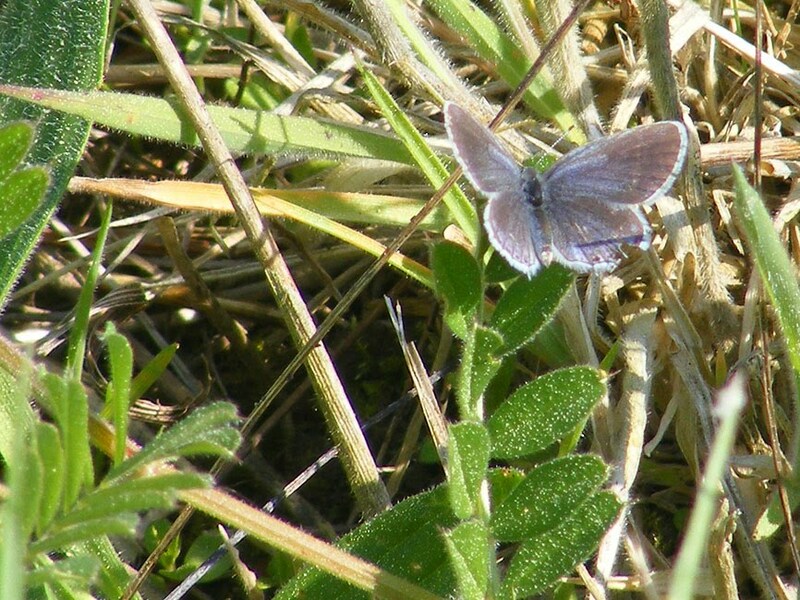 I've written more extensively on these two species over on Loire Valley Nature. The page on Early Purple Orchids is here and the one on Green-winged is here. Yesterday was not a bad day at all. The weather improved, although it was still misty when I left on my pre-breakfast visit to BricoDepot. I managed to buy everything on my list (although I did do some angsting about buying a 68mm electrical box when previously I have been buying 67mm boxes) and was home in time to finish undercoating the attic bathroom before lunch. It now looks super white and snowblindness is a real risk - just as well we are painting the walls green. 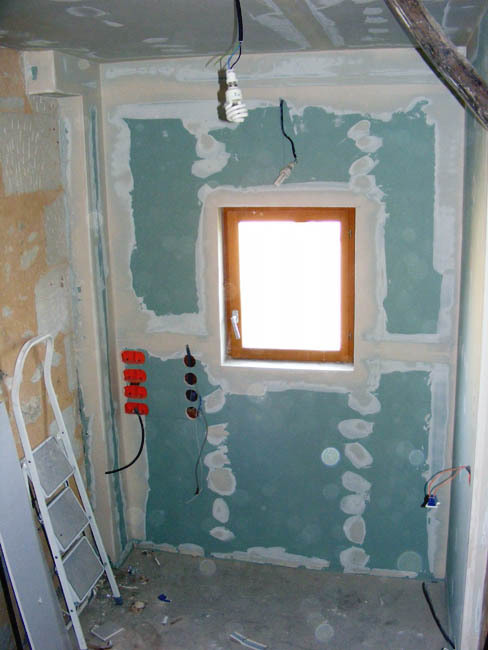 Talking of green: it took us ages to decide on a colour to paint the bathrooms walls. It has to be tonally similar to the bronzed mirrors of the sliding doors we bought last year (mentioned here, yes, we did buy them). We decided on what BricoDepot call "Khaki Vert" as a nice strong colour. After lunch I took the can of paint, which we bought last week, up to the attic bathroom to start on the wall I managed to finish before the undercoat ran out. Lo and behold - it was yellow. Obviously the mixing machine wasn't functioning properly when we bought the paint. This meant that after lunch Susan went to BricoDepot to change the paint, while I started work on sanding and undercoating the office. I have never sanded plaster before (yes, I wore a mask...) and am pretty pleased. There are one or two patches, but I can sort them out tomorrow. We both completed our tasks by arvo smoko time (4.00), which was pleasing. We also solved our stove hood problem: after reading Saturday's blog post Angela and Dennis delurked and offered to bring over anything we ordered from the UK. They have a house just across the Creuse (I know - it may be another department, but people who live that close to the border are OK) and are coming over at Easter time, so it works out quite nicely. As I said - not a bad day at all. Wouldn't you know it - the moment I get motivated enough to do all the painting that needs doing, I have run myself out of paint - on a Saturday evening. This means I couldn't do any painting yesterday (hardware shops don't open on a Sunday) and as this blog entry posts I am on my way to Bricodepot so that work can continue. I only need about 30 litres of undercoat and 20 sheets of 300grit sandpaper and I can move on to the next stage. At the moment I am working on two rooms: the attic bathroom and the office. I had some trouble with the attic bathroom ceiling: I was using a bathroom ceiling satin paint and any imperfections show really clearly: when youre working two metres above your head roller control isn't all it could be so there were plenty of imperfections to be seen. This meant that after using all the ceiling paint (claimed to be "one coat") I had to do a second coat, and for this I used the equivalent paint but for walls rather than ceiling. I assume it is the same things juts not as gloopy. It went on OK, and looks pretty good, so that's that! In the office I have to sand back the plaster joints and then apply undercoat. 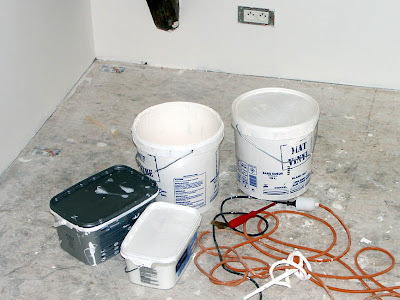 The office will be painted in our usual chalky white matt paint, so it shouldn't be too difficult. I am, however, contemplating buying a tint to add to the paint and having a colour up to wainscoting level and white above. There is one little job I could have finished - the office window. Unfortunately the weather yesterday conspired against leaving a window open for 8 hours while paint dried: whereas on Saturday we had June weather with 28°C and clear sunny skies, yesterday we had March weather, all overcast and cool. It's too early today to say what the weather will be like, but it's not as completely overcast as yesterday was. Or, at least, hats off to one orchid loving roadside maintenance person. I had to spend an hour in Descartes the other day, while I waited for new front tyres to be fitted to our less glamorous car. I walked into the centre of town from the garage and on my way spotted a bank that had been strimmed back to the dirt in a frenzy of spring gardening neatness. All except a flourishing Lizard Orchid leaf rosette, which had clearly been carefully strimmed around. Later in the day I mentioned this to my friend Pauline. Her mower man, Fréderic was there when I visited, whizzing around the lawn on the ride-on, dodging the canes she had put in to mark the orchids in the grass. She told me that he has been rather struck by this practice and has started mowing around the orchids in his own lawn too. She also said that Descartes is particularly conscious of its status as a ville fleurie, especially now that it has gained its third flower. All this made me think I'd better go and check on the state of the orchid patch by the mediatheque in Preuilly. So far, so good. The commune hasn't mowed, and there are about 50 orchid leaf rosettes in amongst the wild thyme. 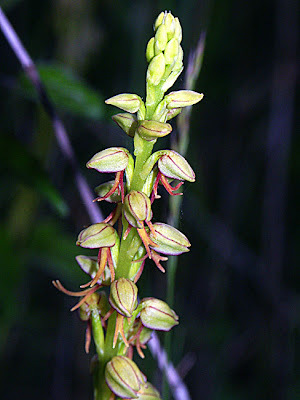 But what really surprised me was that one of the Spider Orchids was actually flowering. 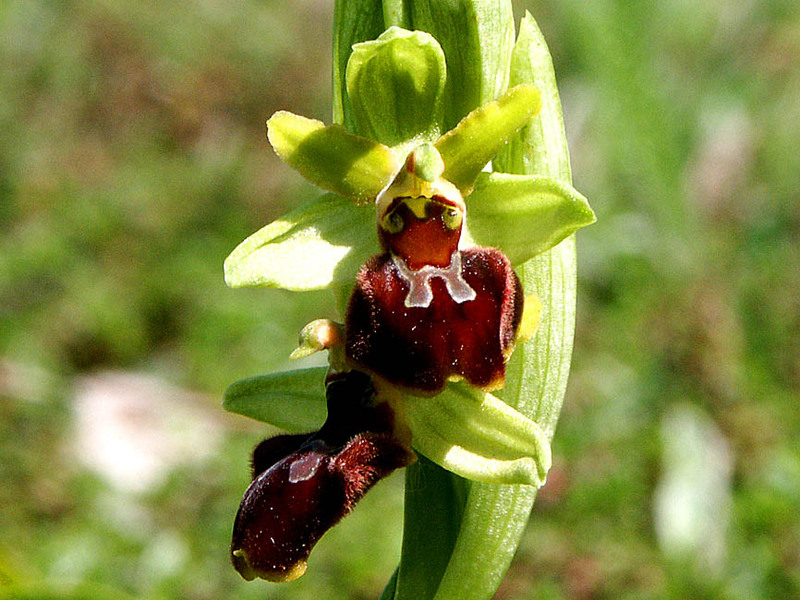 None of the Early Spider Orchids in our orchard is closer than 10 days or a fortnight away from flowering I reckon. It looks like an ordinary Early Spider to me, but just to make absolutely sure it isn't the rare, very early flowering Small Spider Orchid, I have called in the local expert. Monsieur Pelle's response when I told him where I found it was 'Oh la !' and he is coming over on Monday morning to check it out. One of the many things that have been taxing my brain is the matter of the kitchen extractor fan. My original idea was to have a fan that took the hot air and grease from the cooker, up the old chimney, and into the fresh air. A certain kitchen shop told us this is illegal (which it isn't*) in the attempt to sell us a €1600 recycling fan, but it's OK, I took against them for a number of reasons and we weren't going to go with them anyway. Still - it put the idea of a recycling fan into our heads. These have apparently improved massively over the years and now actually work (the one we had in London had the efficacy of an asthmatic ant). We have decided we want an inclined hood. Our ceiling is rather low and I am tall (a giant by local standards) so the normal type of hood wouldn't work for us - I would be looking down on the cooktop through the top of the hood, and forever bashing my head. As I am grumpy at the best of times, this may not be helpful. 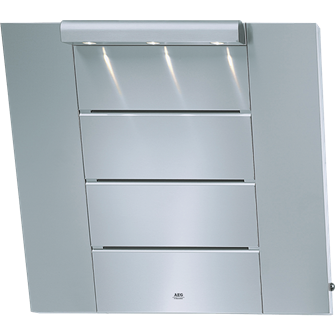 So I have decided on the AEG HD8795, a shiny shiny piece of design that claims to work, will fit between the stovetop and the ceiling respecting all laws about space between things. Of course, these are cheaper in the UK than in France (by about €150), but there is a shop soiled one for sale not too far away. We may take ourselves off to look at it over the weekend, but if it is too scratched we will have to find someone who can bring us a big cardboard box from the UK - the sort of UK electrical places that have massive discounts won't deliver to France. *It's illegal to send extractor fan stuff up a chimney that is being used as a chimney, but we told them it was not in use and they still wouldn't shift on the issue. What was happening chez nous twelve months ago? Alex was working on the coin d'apéro. It wasn't nearly as warm as today, the maximum temperature was 25° C (80°F) yesterday, as opposed to 13° C (56°F) last year, and todays ranges are likely to be the same. The first orchids still had a week until they flowered (this year the first roadside orchids have been out for a couple of days). I said yesterday that we were in a bit of a painting frenzy before my parents arrive (actually, it's unfair to blame them, really it's because we can open windows and doors and air the place). 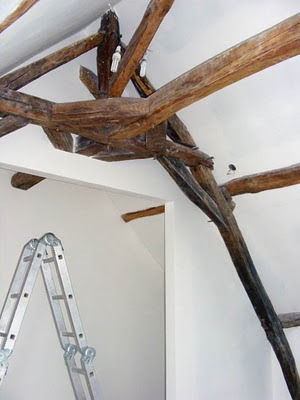 The attic undercoat is drying nicely, and shows up the beams to good effect. Also yesterday, Patrick arrived to do the joints in our office. He returns this morning to do the second stage - patching the little bits he missed yesterday. 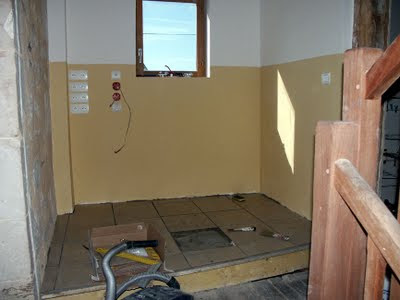 After that I will be sanding it and painting the walls prior to laying a tile floor. In the post I linked to above I wrote "We bought 30 litres of undercoat yesterday evening, so we shouldn't run out!" 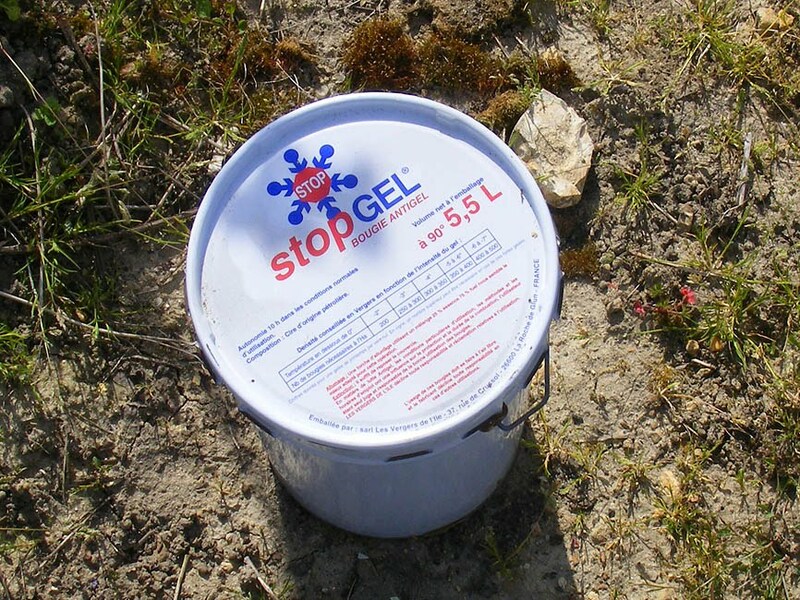 Needless to say, at some time this week we will be returning to Bricodepot to buy another 30 litres. 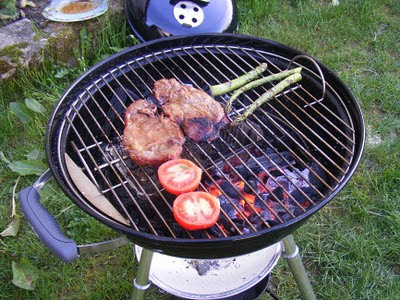 It feels like spring has arrived: we had our second BBQ of the year yesterday (pork chops this time, with grilled asparagus for Susan), things are growing in the garden (mainly garlic and onions, but the beans and peas are starting to show serious intent), and we have had all the windows open and are in a painting frenzy. 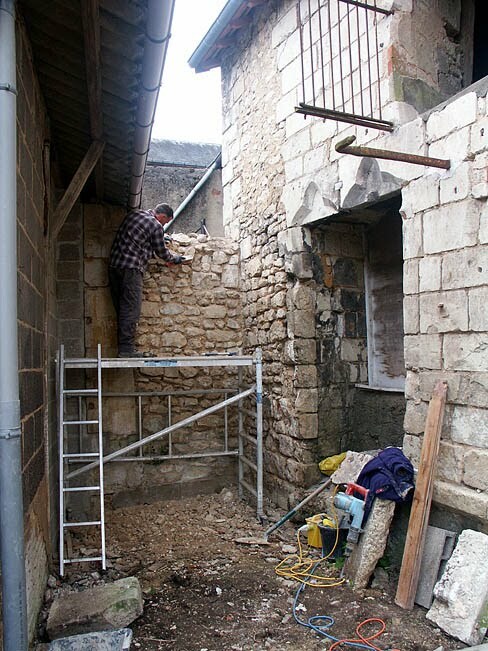 My parents will be visiting us this summer - they were last here in June 2007, before we had started work on the house. While they were here they helped me strip out the old lambris (the wooden panel stuff seen on the left in this picture) so they will certainly notice some difference, and we hope by the time they arrive there will be even more difference to notice. Hence the painting frenzy. Another task that was done in June 2007 was weeding the back garden. This meant my mother and Susan chipping out every last strand of bitey things. As bramble and nettles were the only thing growing in the garden this was quite a task, and one that everybody involved thought would be only temporarily sucessful. Luckily were were wrong, and the garden has just about stayed under control. Today I take a break from painting the attic bathroom - the undercoat takes 2-3 days to cure. That gives me time to paint the office window and window ledge we put in last year.